I think slips have become a thing of the past (vintage? ), except for my prim, proper and practically-perfect-in-every-way little ladies. (hahaha!). For most of their dresses, I line the whole dress or the bodice, at a minimum, just to be sure they are covered. But, they still need slips periodically. 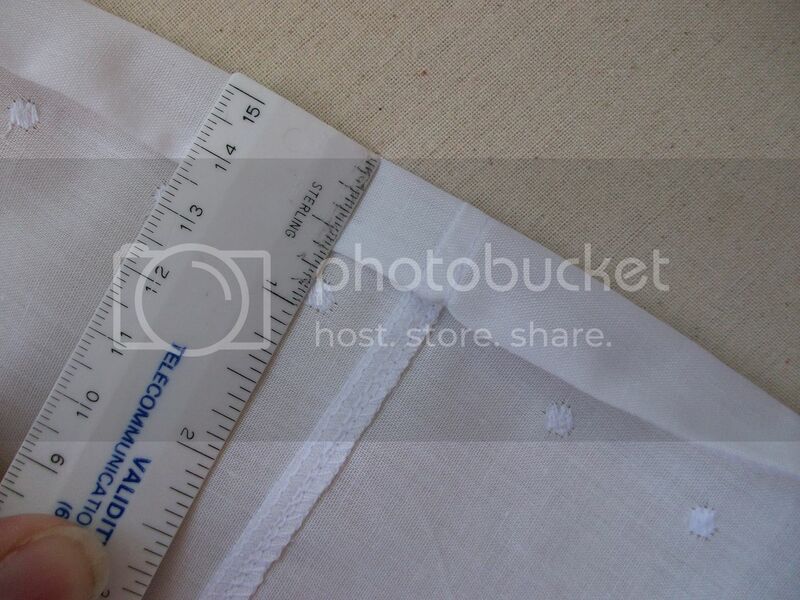 Here's the easiest slip you can make: A half slip made from fabric with a hem "built in". 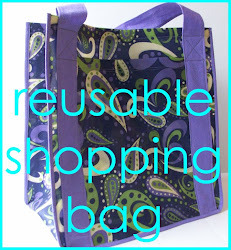 You will need to purchase fabric that has a decorative edge along the bottom. This will be the bottom edge of your slip. Step 1: Get measurements for the waist and the length. Measure your little girl around the waist. Don't be confused where her waist is--just measure right where the top of her pants hits because that is where she will wear her slip. You want to measure against her skin, though, so use her pants as a guide. Use a flexible measuring tape if you have one and pull it snug--no slackness--but not tight to get the best measurement. If you use something else to measure (belt?) and plan to measure that item, that is fine, but do not use anything stretchy like yarn. Next, you need the length you want the slip. Measure from the top edge of the pants to the point where you want the slip to fall or the finished length. You can take this measurement over clothing. For the length of fabric, you need to use 1 1/2 to 2 times the waist measurement. I tend to use a number closer to 1 1/2 times the waist measurement for the half slip because I do not want it to be too full. For the width of fabric (from selvedge edge to selvedge edge), you will use the length measurement from above plus you need to add 1 inch for your waistband. Example: My daughter has a 22 inch waist and a length from waist to top of knee of 14 inches. So, I used one yard of fabric (36 inches) and cut it along the length of the yard at 15 inches from the bottom. 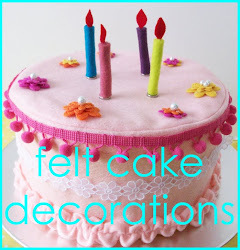 If you are cutting with a rotary cutter, be certain that you line up the decorative edge very carefully! I ended up with a piece of fabric that was 36 inches long and 15 inches wide with the decorative edge all along the 36 inch length. A little confusing in words, but not when you do it. Step 3: Sew the two short sides together by placing right sides together and sew a 5/8 inch seam allowance. You can serge or zig zag the edges to make it pretty. Be certain to line up the decorative edge so it looks good--you can trim up the side later. Step 4: Iron your seam towards the back of your skirt. In this case, there really isn't a back or a front so it isn't critical. Be sure to iron your seam smooth, though. Step 7: Turn down the top edge another 5/8 of an inch (I always measure the whole way around.) and iron it down. Step 8: Sew the waistband casing down along the edge. Leave a 1-2 inch gap where you will insert your elastic. I like to leave the gap around the side seam. Step 9: Cut 1/2 inch wide elastic the length of waist measurement minus an inch. 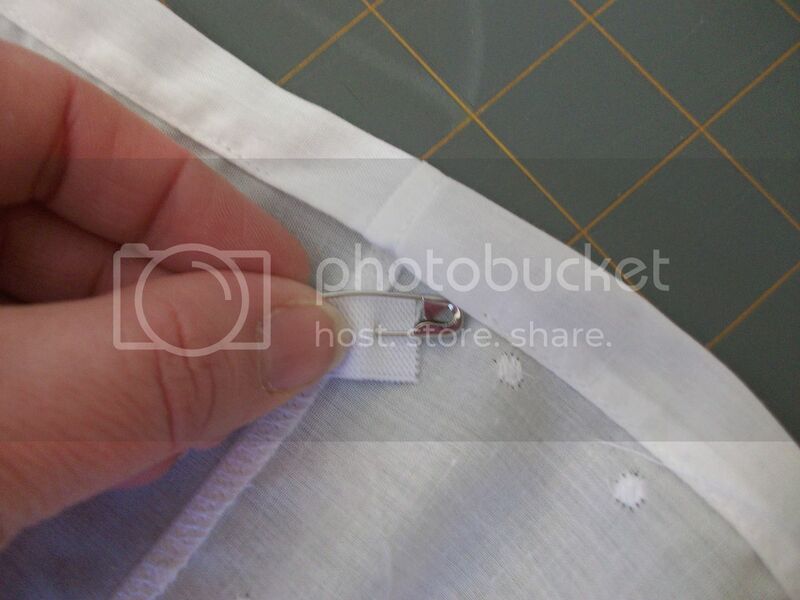 Step 10: Insert elastic into the casing by fastening a safety pin to one end and gently pushing it through the casing. Be sure you do not pull the opposite end all of the way into the casing. You can pin it down on the outside to prevent this from happening. Step 11: When the elastic comes out the other side, remove the safety pin and layer the end over the end of the other side. The elastic should be flat. Zig zag stitch along this lapped section to secure the ends together. Trim any excess elastic if necessary. 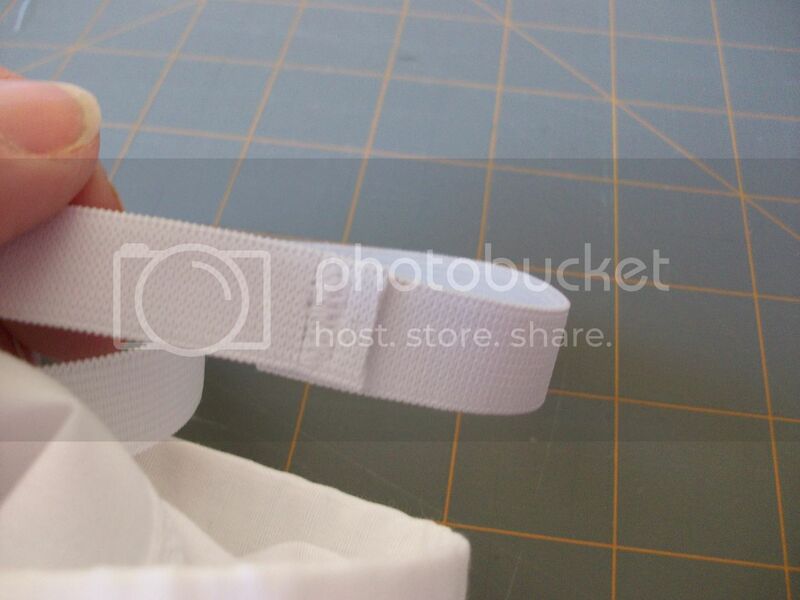 Step 12: Gently wiggle the elastic into the gap you have left and smooth out the fabric over the elastic. Sew along the edge of the gap being careful not to catch the edge of the elastic. 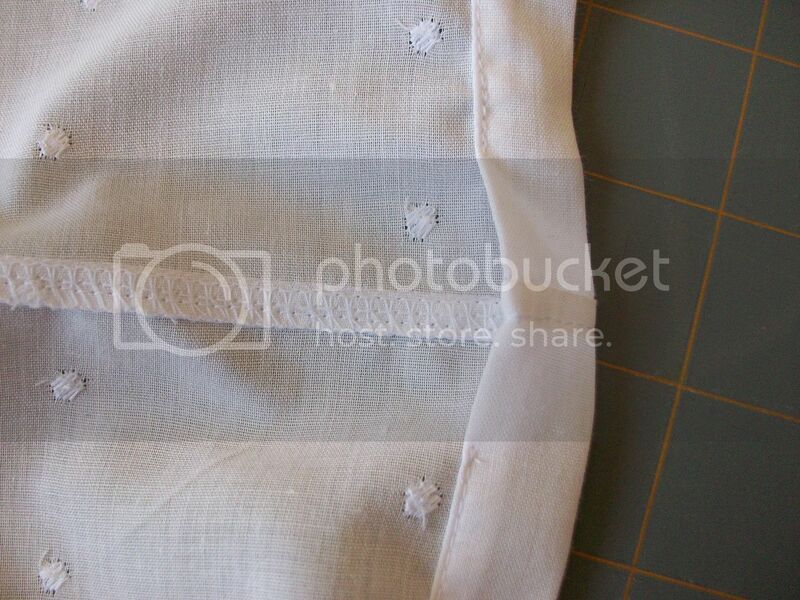 Step 13: Slide the gathers along the elastic to space them evenly along waistband. 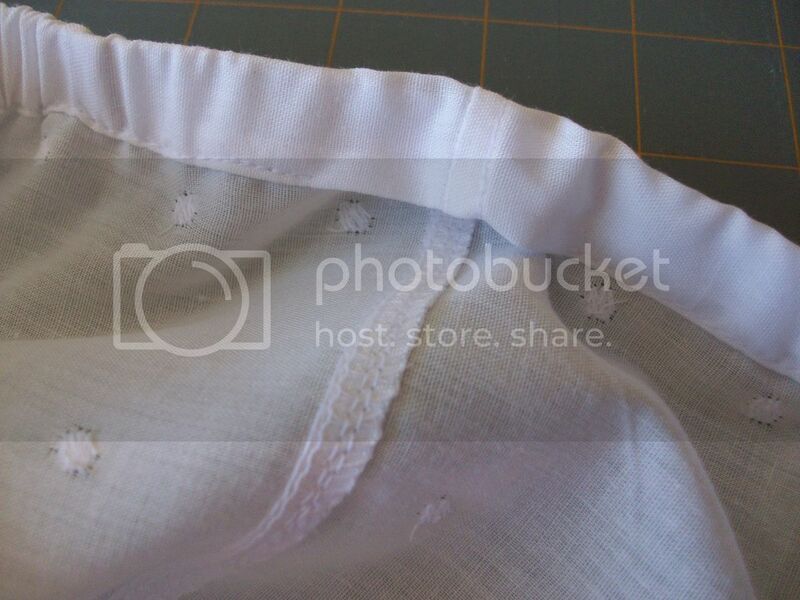 Step 14: Use Fray Check on the end of the seam where you have the decorative edge. This will help keep it all together. Step 15: Wash your slip before it is worn to help the elastic return to it's "normal" shape. Often, when you put it in the casing, it gets stretched out and you want it to go back. Lots of little steps to this, but they aren't difficult. 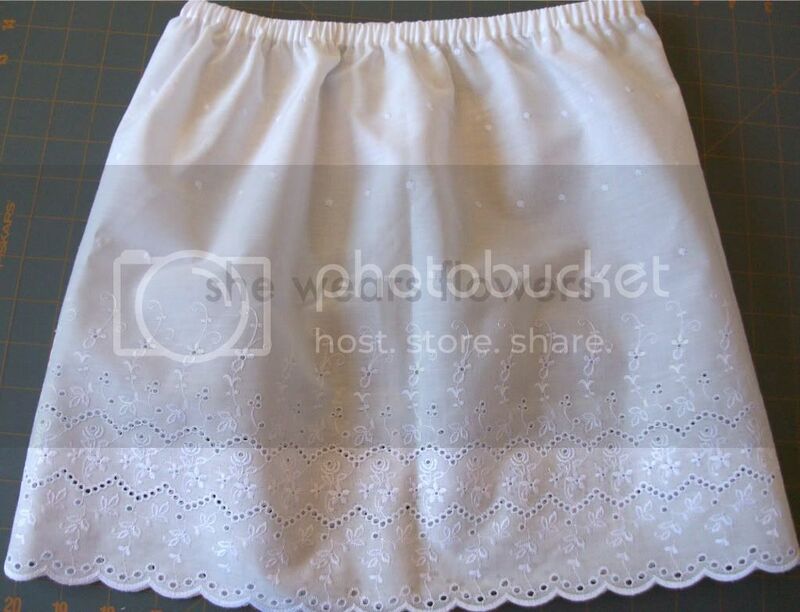 And, now that you can make this, you can also make any gathered waistband skirt. 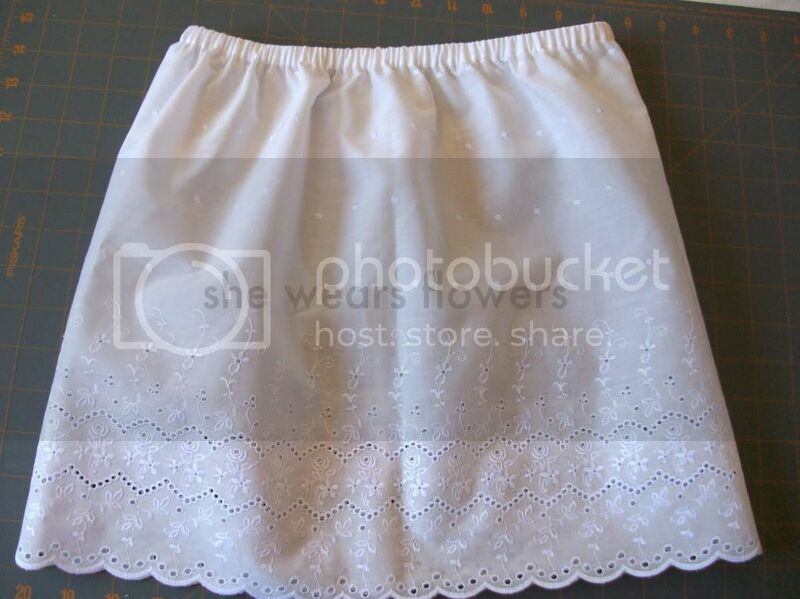 By varying the width of the elastic (I like bigger elastic for a bigger-type of skirt) depending on what kind of skirt you are making, you can make anything from a school/church skirt to a play skirt to a dress up skirt. I do recommend using twice the waist measurement for a full, twirly skirt. 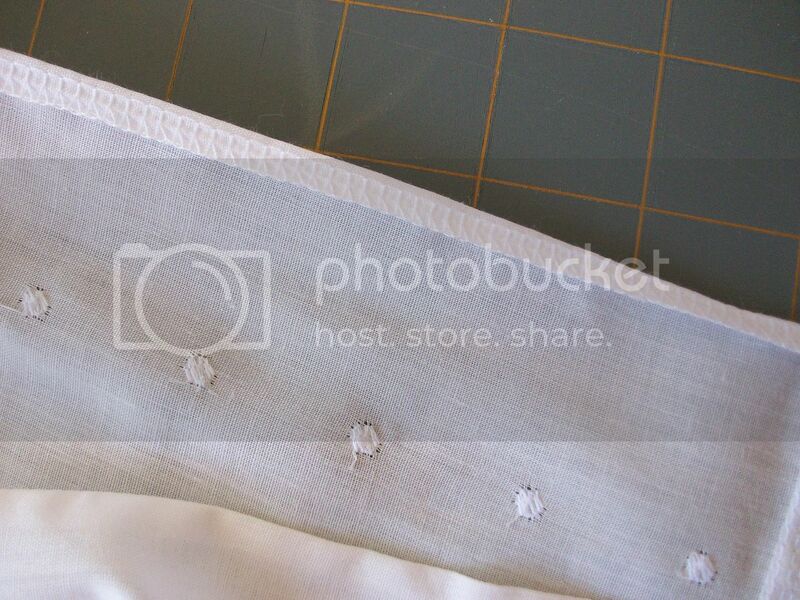 And, you will want to put in a hem for fabric that doesn't come with a decorative edge. 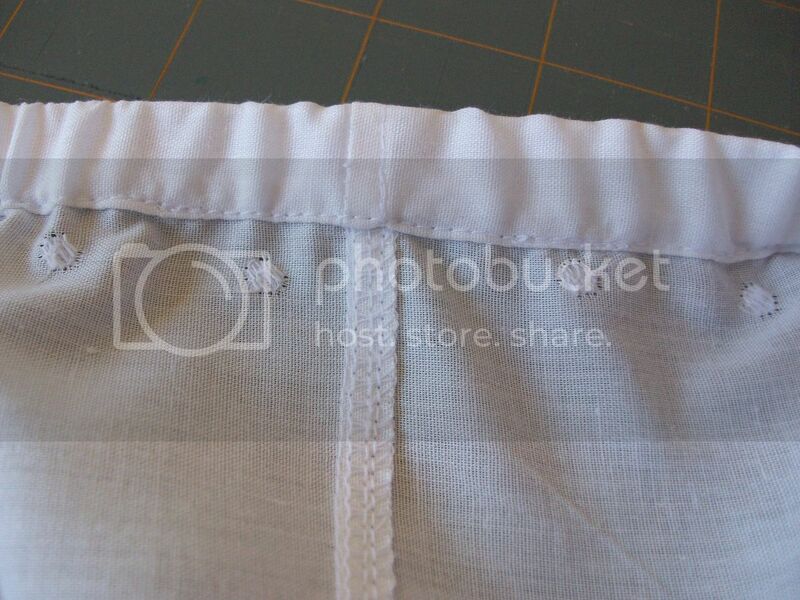 The hem is made the same way as the waistband casing, just don't leave a gap to insert the elastic. 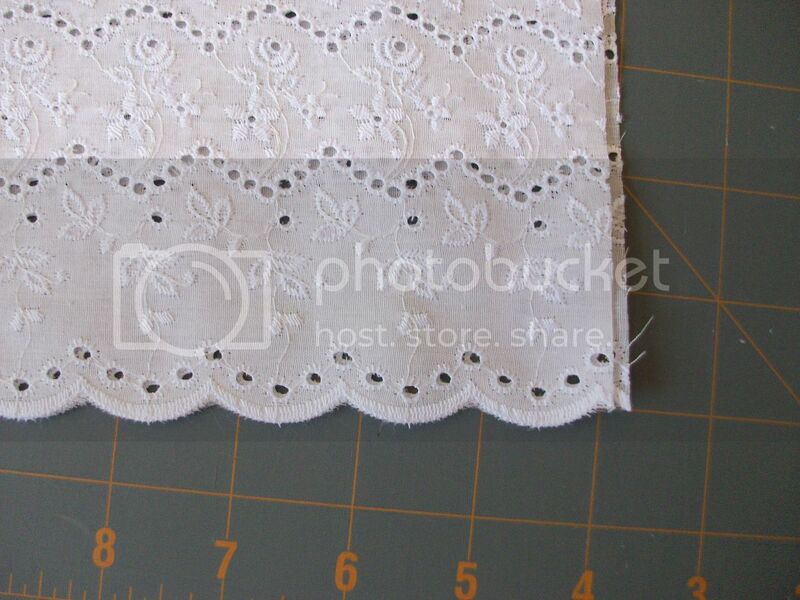 Or, if using fancy, dress-up skirt fabric, you can get away with adding lace or something decorative to the bottom or just serging a rolled-hem in place. 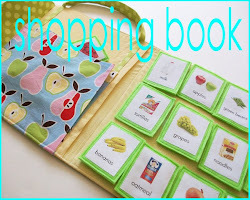 Brilliant idea and beautiful tutorial! Thank you so much for sharing! This slip is so pretty it shouldn't be hidden under a dress! 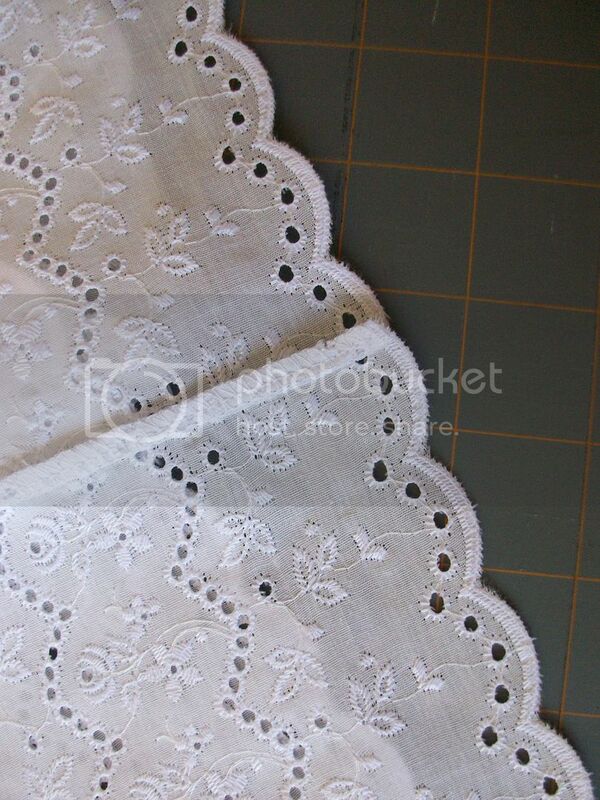 I think it would look so cute peeking out under the hem of a dress kind of like a petticoat. I love slips! Especially pretty lacy ones. I have a couple vintage slips I got at Aaardvark's in Pasadena that I love to wear under skirts. I'm glad you did this tutorial. 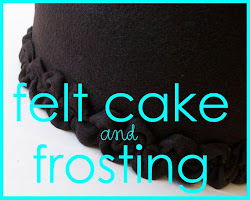 And yes, I am "back," but physically only :) I'm so behind on blogging!